It can be really frustrating and upsetting when the online movie you are watching becomes interrupted or runs jerkily due to slow internet connection. You cannot enjoy a smooth movie session when the video clip keeps pausing to stream the video. To get rid of this problem and reduce the time in buffering video for a smoother effect, here comes the tool for movie fans, SpeedyiTunes. 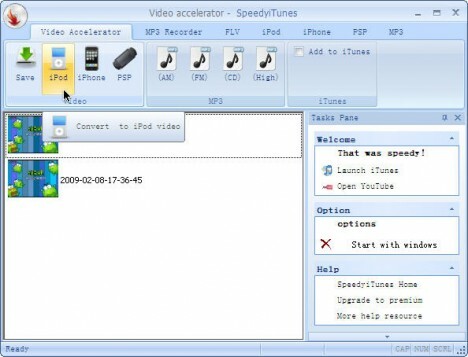 SpeedyiTunes is a free application which can assist users to accelerate streaming online video. Once installed, users can enjoy a faster download time of flash videos, movies, songs, etc. It cuts down the download time regardless of whether users are experiencing slow or fast connection. Users can use this application when watching or downloading video clips from YouTube. Besides YouTube, this program also works on other video sites such as MSN Video, Yahoo video, AOL video, MySpace video, MSN video, Veoh, etc. Besides speeding up the streaming of online video, users also can make use of some features such as record streaming MP3 while users are listening online. Users can just tune on the record button to record the songs or music. SpeedyiTunes supports almost all browsers such as Internet Explorer, FireFox, Opera, Google Chrome, AOL, etc. Users can download the latest version of Speedy iTunes via the link here.